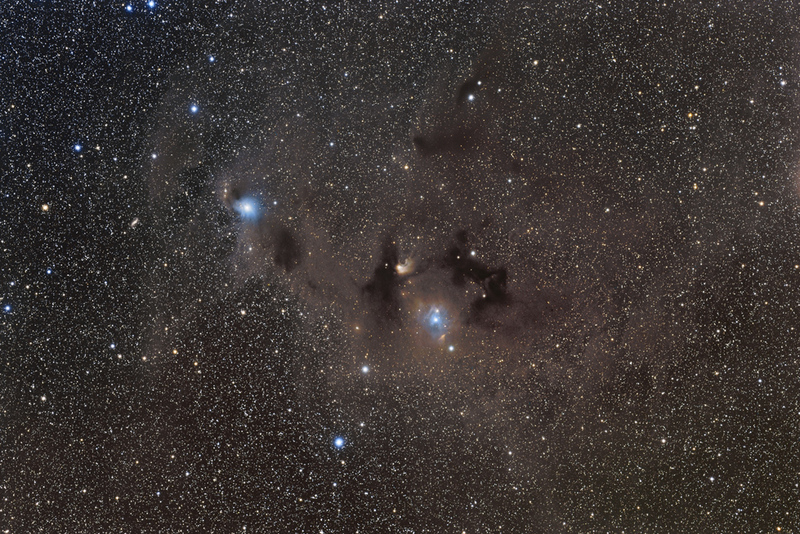 Chameleon Cloud Complex: This is a region of gas and dust: The bright blue (reflection) nebula left of center is IC2631; the little galaxy to the left of IC2631 is NGC3620; the other blue (reflection) nebula (just below center) is Ced 111, and the ivory-colored nebula in the center of the image is Ced 110; the small, reddish triangular nebula just below Ced 110 is the Chameleon Infrared Nebula, GN11.07.3; the dark nebula to the right of IC2631 is Bernes 142; the dark cloud below Ced 110 is Sandqvist 135. The cloud is estimated to be 400 to 600 light years from us. Equipment: Takahashi FSQ106, SBIG STL11000 (with Astrodon Generation 2 filters), on a Bisque Paramount ME German Equatorial Mount. Image Acquisition/Camera Control:MaximDL, working in concert with TheSky v6, all controlled with ACP Observatory Control software. Processing: All images calibrated (darks and dawn flats), aligned, sigma reject performed, and combined in CCDStack. Luminance layer deconvolved in CCDStack. Color combine in Photoshop. Finish work (curves and levels, and increasing saturation) was done in Photoshop CS5. Location: Data acquired remotely from Fair Dinkum Skies, near Moorook, South Australia. Date: Images taken in March and April 2013. Image posted April 8, 2013.